Habitat: The plant is native to Australia. Description: Blue Gum Tree is an evergreen plant. It grows from 30 to 55 meters tall. Its trunk is smooth and grey-white in the upper part, and rough and deeply furrowed near the base. Leaves are glaucous, glossy-green, bluntly pointed at the tip and rounded at the base. Single, creamy-white flower is usually produced on the leaf’s axils. Flowering occurs in early summer. The large woody fruit is flat-topped and opens by 4 -5 valves through which seeds are shed. Parts used: Leaves and essential oil. Useful components: Volatile oil, polyphenolic acids, flavonoids, tannins, aldehydes, bitter resin. 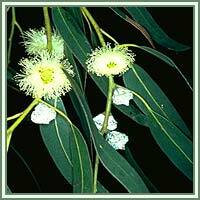 Medicinal use: In traditional Aboriginal medicine the Blue Gum Tree was used in poultices for treatment of wounds, different types of inflammations, back conditions and rheumatism. It was inhaled for headaches, or drunk as an infusion in cases of colds. 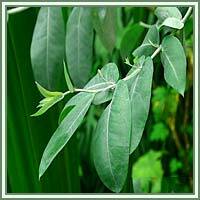 Eucalyptus oil is a strong antiseptic, useful in treatment of lung diseases, colds and sore throats. Its expectorant properties are useful in case of bronchitis. It can also be used as a vapor bath or chest rub for asthma and other respiratory ailments. It can also be used as massage oil for painful joints. A cold extract made from the leaves is helpful in treatment of indigestion and intermittent fever. Safety: If taken in large doses, the oil irritates the kidneys. The plant shouldn’t be used internally. Always consult your doctor/herbalist before consumption of any herb.